East or West Home is the best! No matter where we are; be it in the comforts of a friend’s home or a luxurious guest house, at the end of the day when we are tired from our long sojourns we all crave the comforts of our own home. The joy and reassurance that comes from being under the safe confines of one’s home are incomparable to anything else in the world. But imagine a life, where you did not have a “home” to go back to? Imagine having to face the forces of nature as well as the scorn of other humans by having to sleep the nights curled up in back alleyways, tunnels and subways. Imagine having to scour other people’s trash for fulfilling one’s basic needs. I know it is not a pleasant thought, and I apologize about asking you to imagine it. Unfortunately for a lot of people this is not an imagination, it is an unfortunate reality. Homelessness is more rampant that we care to admit. And although we see a lot more homeless men, the truth is that women, children as well as entire families are often caught into the throes of homelessness. 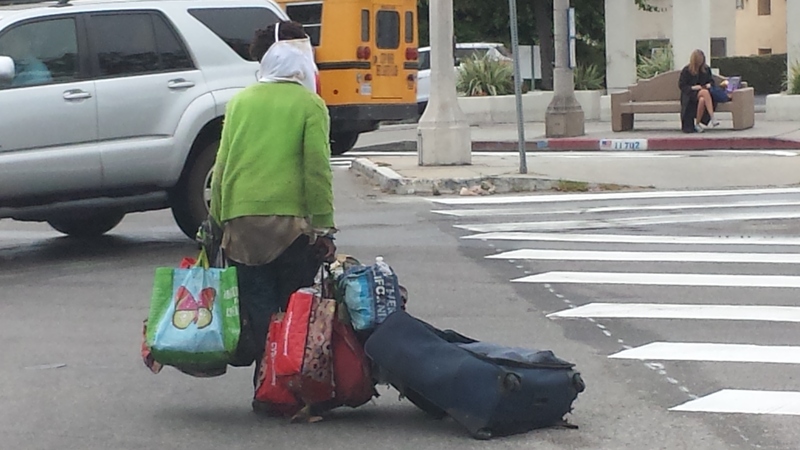 Here is a picture of a homeless woman crossing a major intersection that caught my attention this morning. It seemed to me that the bags in her hand that she was so passionately pulling across the street possibly constituted her sole possession in life. Unlike popular belief, homeless people are not homeless because of choice or by birth. 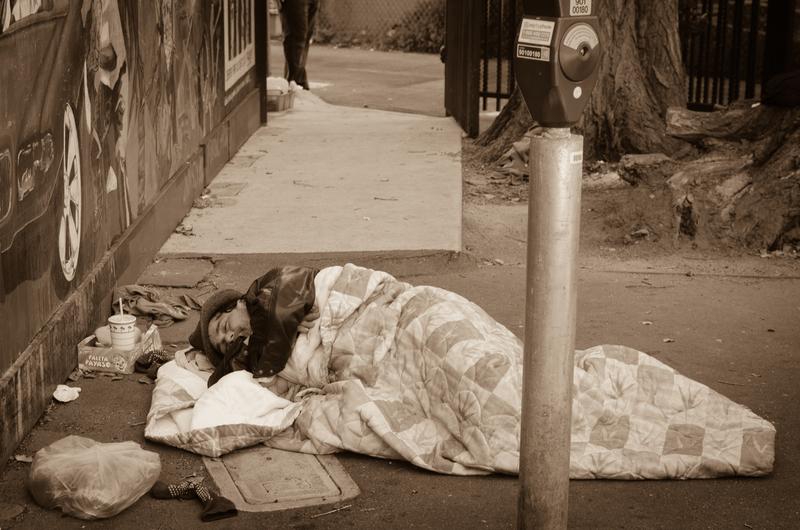 More and more people join the homeless numbers every year, due to some unfortunate events. According to the Homeaid.org website there are many causes for homelessness. Homelessness can be caused by “tragic life occurrences like the loss of loved ones, job loss, domestic violence, divorce and family disputes. Other impairments such as depression, untreated mental illness, post traumatic stress disorder, and physical disabilities are also responsible for a large portion of homeless.” (http://www.homeaid.org/homeaid-stories/69/top-causes-of-homelessness). Needless to say, homelessness and poverty go hand in hand. People who live from hand to mouth can easily be pushed into homelessness by job loss, sudden sickness, accident etc. I wonder if the high rate of inflation, high cost of living and an equally high unemployment rate as well as continuous decline in manufacturing jobs are factors that further push people closer to the poverty line. Because a large number of manufacturing jobs keep moving overseas, the low income wage earner finds it harder to stay employed. Is it my imagination that the middle class is shrinking in numbers? The poor get poorer and the rich get richer, meanwhile the middle class is corroding and possibly joining the ranks of the poor, as salaries and jobs fail to rise in comparison to the high cost of living. This is a mighty problem we face. Before we jump in to suggesting solutions, it is important to remember; that “Homelessness” is not merely about a condition in which one is homeless, but more importantly it is about self insufficiency or the inability to provide for oneself due to any number of causes. Although the individual and the state jointly own the lion share of providing its people with affordable housing and subsidy programs, all of us as fellow citizens and neighbors have a responsibility to fulfill as well. Help people help themselves. Give a man a fish and you feed him for a day, teach a man to fish and you feed him for life. If you can, carve some time out of your busy life and donate your time to charities, schools, local institutions to help people in need. Teach children and young adults a new trade. Donate your time to help others, teach them whatever you are good at. Donate goods, food and time to charities. Most of us are good about saving our well used items and donating them. I do not support donating dollar bills to homeless people as I worry it may promote rather than hinder poverty, however any act done out of kindness is better than nothing. Be kind. Above all treat people with respect and kindness, the same respect that you would like to receive. Sometimes a simple word of kindness goes a long way in warming a distressed heart. I feel no words can explain it better than these simple words from the Bible, “Do to others as you would have them do to you”. Give people a second chance. A lot of times people make mistakes and get into trouble. Being involved in Bankruptcy, foreclosure, lawsuit and or having a criminal record can mar a person’s chances for employment for years. But isn’t America supposed to be the land of opportunities? If a person made a mistake once, but has paid his/ her dues and taken steps to work on improving one’s situation then they should be offered a second chance. Employers should consider people with a less than glowing background a chance at improving their lives. Not giving them a second chance will only cause them to go further into the dark dungeon they just came out of. None of these acts alone, may be enough to end homelessness but we cannot shun responsibility entirely simply because a perfect solution may not yet be in sight. We can continue to work with charities to see how we can further prevent more people from falling below the poverty line and into the throes of homelessness. Remember that the homeless man or woman you see on the streets could well have been you or me, with a simple twist of fate. Let’s do our best today and every day to help others around us. Even small drops of kindness can fill an ocean of love. Do you have a story to share on this subject? Do you have an idea how we can play our part in helping homelessness and ameliorating poverty in our neighborhood? If so, I look forward to hearing from you. This is a sobering and sad truth. This is supposed to be the land of the free, but free to be what? Work at jobs that don’t keep up with the cost of living? Free to live on the streets where that very circumstance forces many to go? How can one enjoy their freedom fully when they can’t even take care of themselves? Surely, the government knows that if people don’t receive appropriate wage increases to match the cost of living, how in the world can they be expected to survive? Businesses keep closing down because people aren’t buying, because why? They don’t have the means to. Yet prices are steadily rising. This is insanity on the highest level. Obviously, it may not be a concern for the powers that be but it should be for fellow mankind. Because like you said, at any time, any one of us could find ourselves in a similar situation, God forbid. We are all going to have to do our part, whatever that may be. After all, weren’t we put on this earth to be a support and help for another. Until in stepped greed and people wanting more than their share! I could go on and on with this subject but I will spare you. Great and truthful post! Dear Fellow blogger, thank you for your heartfelt comment. I share your thoughts and concerns 100%. You hit the nail on the head on all points. America always did well because of the small to mid size businesses which can no longer stay afloat and are being bought out by the “big fish”. The big industrialists have only one thing in mind: Money. I understand the primary rule of all Business is to make money. But if the people of your country don’t have jobs they won’t have the money to buy your goods. The Government is either too busy sorting too many issues or finds itself unable to solve all the issues due to red tapism, bureacracy and simply politics. Every year more and more young people graduate with tons of debt only to be thrown into a market where they are either unemployed or underemployed. I have not even started to talk about our Vets who served the country only to come back to a broken economy. Its easy to get the poor and middle class to do something, but what about the big industrialists? Thanks for your comments. You are so welcome and correct! It’s kind of hard to keep smiling with all this wrong going on around us. But try to any way! Have a great evening! Thank you M-R. I am not sure what a Christian piece of writing is, I only hope it is effective? If not, I would love to get some pointers. Yes, it seems the corrosion of the middle class and the rise of poverty and homelessness is a worldwide phenomena…even more worrisome! Good point ! Well, as I understand it, christians are people who do good because they are, at the basic level. They’re not motivated by any underlying motive. Not that I have any personal understanding of this, mind ! Ha ha you are too cute! Thank you dear blogger friend. I appreciate your thoughtful post, ubecute. You’re right about the middle class shrinking and the inquality increasing. The deep disconnect between the few who hold too much and the poorest who hold nothing isn’t only an American issue. The whole world is experiencing the same unfairness, creating many problems. Homelessness is one of the most traumatic and it always breaks my heart to see someone on the streets. Unfortunately, I’m sure that the few dollars I often give won’t change much. Writing about it is still a very good thing to do, and again I appreciate your kindness and caring attitude. Let’s talk more about equality and social justice! Dear evelyneholingue, thank you for your very kind comments. You are very correct, that the shrinking of the middle class has become a world wide phenomena. Sad as it is, it seems there is little we can do to change it, besides continuing to do play our part. Unfortunately as long as greed remains the primary driving force, the problem is only going to continue to get worse. It also doesn’t help when local manufacturing globally continues to either be consolidated away from small towns that rely on it, or sent offshore entirely because it is the “cheaper” option. But as long as those of us who can, continue to raise the issue and keep it in people’s minds then hopefully it will put the politicians and mega business owners on notice. Thank you for your comments and feedback, fully agree. I also think that the gorvernment needs to create incentives such as tax write off so businesses continue to keep operations locally, thus giving the local population more chance for staying emplyed.